We’re getting closer and closer to Christmas, and the past few days I’ve been spending quite a lot of time on the gift wrapping. This is something I love to do and put quite some effort to every year. Some more advanced than others. I tend to buy quite a lot of gifts, and this year I have my boyfriend and his family to gift to, so there is a few gifts under my tiny tree. If you’re not done with all your wrapping yet, and needs some inspiration to get going, this post is for you. I haven’t taken pictures of all my gifts, but I have collected some to show. I am not the person that uses one or two different kinds of papers to make it all match under the Christmas tree (it never would anyway with six people putting their presents there). I like to mix match and give every gift their own identity. Enjoy the pictures, and if you’re interested, read my thoughts bellow. 1. I love using miniature ornaments on my gifts. It’s an easy way to show extra effort. If you look carefully at the picture you will also see a golden net under the red ribbon. One of my favorite wrappings this year. 2. I like to save small pieces of paper from other presents to use as a mat under the ribbon. An easy, and cheap way, to give the gift an extra touch. 3. Sometimes less is more. Just a little bit of ribbon, to show the beautiful paper with the reindeer. 4. Again, less is more. Just a simple bow to go with the old fashion Santa paper. 5. No Christmas without glitter! Sometimes I like to go out of the box and not only use the traditional colours. This year I had no choice when I found that beautiful bling ribbon, and blue and pink where the only colours left. 6. Old fashion is beautiful. Here the traditional brown paper with God Jul (Merry Christmas) printed on it. 7. Another way to wrap the ribbon around the gift. Still with focus on the really cute paper. 8. I always have to make one very special gift for my sister to open up. It’s tradition! This year with double mats under the ribbon, laces and ornaments. I’m sure she’ll like it. 9. The last gift was actually wrapped about three years ago. It was my contribution to the Christmas gift game. My Grandmother decided this was her gift and worked really hard to win it. She did, saved the box, put a present in it and gave it back to me for my birthday in September the following year. For Christmas I filled it up again and gave it back to her. We’ve been doing this ever since. It’s getting a bit nagged, but that’s part of the charm. What do you think? Do you have a favorite from the ones above? Or a nice idea to share? This entry was posted in Lifestyle and tagged Christmas, DIY, Inspiration by Anna S. Bookmark the permalink. The wrapping looks great! I’m no where near as creative and usually end up just wrapping it and, if i’m feeling extravagant sticking a bow on I love the idea of putting small ornaments on though, might have to try it this year! These all came out beautiful! I love the little details! 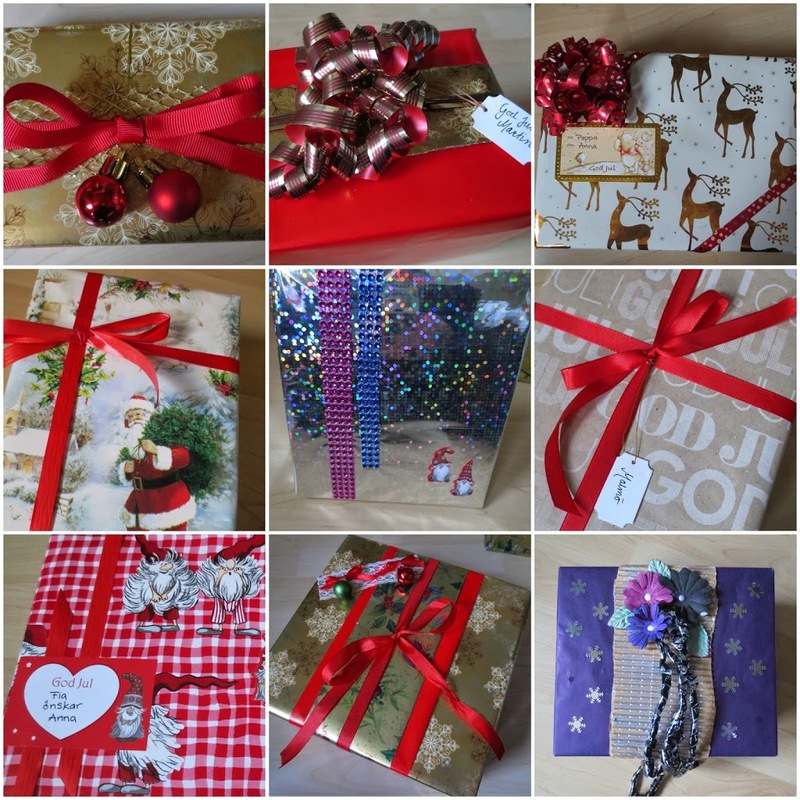 I just love giftwrapping! What a gorgeous inspo Anna! Thanks for sharing!